Vintage Disneyland Tickets: Disneyland in Slides - 1958? 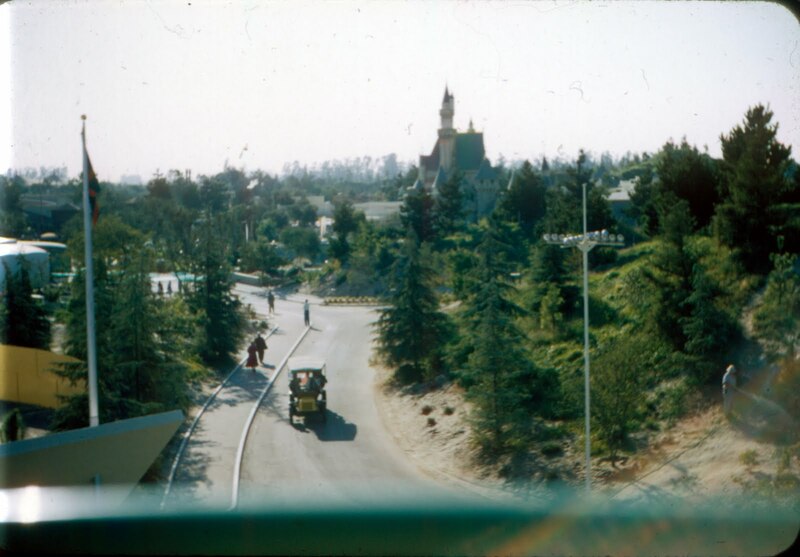 I was going to post a couple of slides from July 1969 but these two skyway shots caught my eye instead and they fit right in with Wednesday's 1958 post. I'll post the 1969 slides next week. These Kodachrome transparencies have no date. Based on the presence of the House of the Future and Snow Hill I'd place these around 1958. Did you know the Horseless Carriages went all the way up to Fantasyland? I thought only the Omnibus went that far? In fact, this June 1960 ticket book (link) shows the Omnibus on Main Street and in Fantasyland, but not the Horseless Carriages? Weird little curb in the roadway to separate the guests from the vehicles... This area at this time in the parks history fascinates me to no end - I see the Yacht Bar Roof!!! Is that still the same little castle? Until about 15 years ago I never knew it was there! Neat stuff back stage. Come back tomorrow for the entire issue for Vacationland - Fall 1958. Oh my goodness, I learned something new about Disneyland today!!! How very, very cool these photos are! 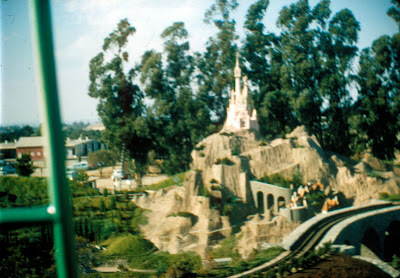 The castle in the second shot isn't backstage, it's a part of Storybook Canal Boats. It's Cinderella & Prince Charming's castle! You can see the Casey Jr. train tracks right next to it. I've wondered if the castle and rockwork are still original too. I remember at some point in the nineties, it was all under scaffolding and tarps and when they came down, the rockwork looked a little different and was a different color. I wondered if they had just redone the surface, or tore the whole thing down and rebuilt it. Anyone out there know for sure? The horseless carriage and the yacht bar must have been a great contrast. Thanks for the story book land shot. One of my all time favorite parts of Disneyland.